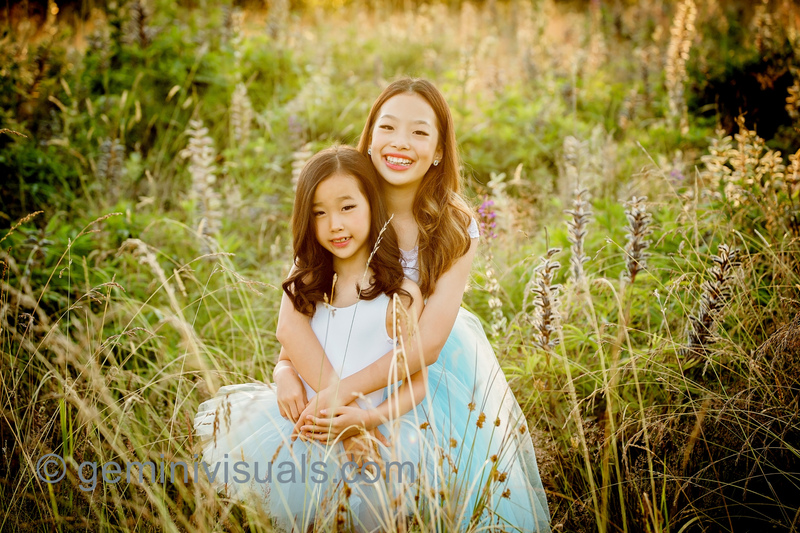 Many of our clients we meet through all of the dance school photography that we do in BC. Over the past several years Adrienne has been doing many of the dance school photo days all over the Lower Mainland. In addition to dance school photos, we have added Creative Dance sessions as many dancers are interested in getting more moody or stylized photos which are separate from the group or costume photos done at their dance studios. Sometimes we are simply hired for a private session. We can do all types of photo sessions including stylized dance photos either in-studio, on-location or a combination of both. These dancer sisters danced at the Dance Lab in Coquitlam and now dance at Simply Ballet. Both very talented, Adrienne did a variety of different setups that included individual photos and some shots together. We offer a variety of packages for creative dance sessions and for this session, Adrienne was able to get a variety of different poses with many of the costumes that they brought with them. These girls were all smiles and a delight to photograph. Similar to Senior portraits or Grad photos, we can do a variety of different shots for your child, tween or teen that include their passion or representing a hobby that they love. Creative dance photography is a specialty of Gemini Visuals, but if you have an idea for a photoshoot that you would like to try, contact us. These two sisters still have a long way to go before their senior year, but I look forward to photographing these two talented dancers for years to come. To inquire about Creative Dance Sessions, please contact us via our website. 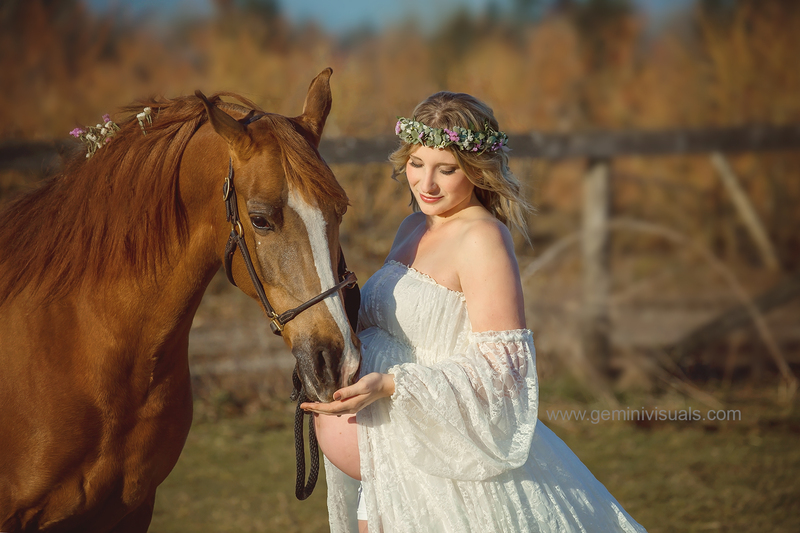 Shooting maternity sessions has become one of my favourite things to shoot, and often times, I will see the new mama again with her baby for a newborn session. 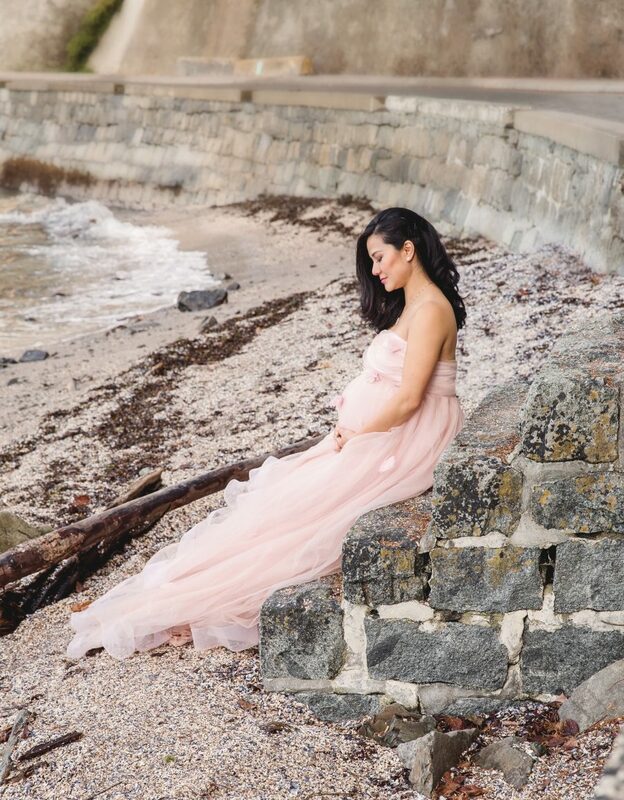 Over the 20+ years that I have been doing photography, maternity sessions have become more popular, and therefore, finding gorgeous props and dresses has become easier. Many of the dresses in my studio come from a Utah-based company called Sew Trendy Accessories and these work for a variety of image settings, both indoors and outdoors. In late 2012, Sew Trendy started out of the founder Valerie’s basement, after she received a sewing machine as a gift from her grandfather. Six years later, the company has it’s own warehouse and a number of seamstresses making dresses full-time and shipping them all over the world. We have a variety of different Sew Trendy dresses in our studio, in various colours and sizes. Some expectant moms are happy to show their growing belly, and others want to be more modest, and in the Sew Trendy dresses, we can accommodate both. 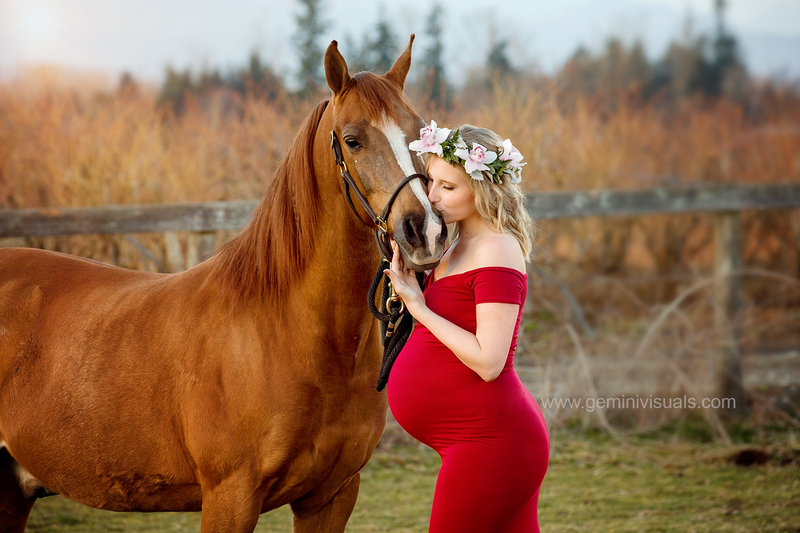 A few months ago, I shot a creative maternity session at a Langley farm with expectant mom Ashleigh, who I met through the Peace Arch Hospital Foundation. Ashleigh wore two of our Sew Trendy dresses, and is pictured with her gorgeous show horse GREAT AND NOBLE PF. Her flower crowns were created by Ever Red Fresh Designs and her hair and makeup by Scarlett B. This lace gown is called the Valerie, and looks especially dreamy in these photos. Beautiful Ashleigh gave birth to her baby girl just a few short weeks after this shoot. Some of the knit gowns from Sew Trendy Accessories, we are able to use for our creative dance sessions also. There are 6 new Sew Trendy gowns that have just arrived at the studio and I am looking forward to shooting some creative outdoor maternity sessions and dance photos this summer with our new dresses. Watch on the Gemini Visuals Instagram account for some sneak peeks of the new dresses available. To book your Summer or Fall maternity photo shoot, contact us. For a detailed list of our package sessions available, Click HERE. 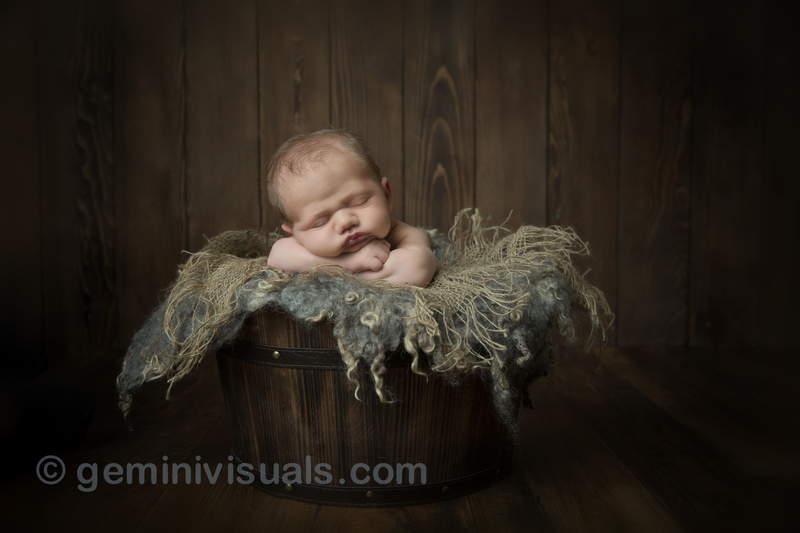 It’s always a pleasure when a family or friend comes into the studio for a photo session with their newborn baby. 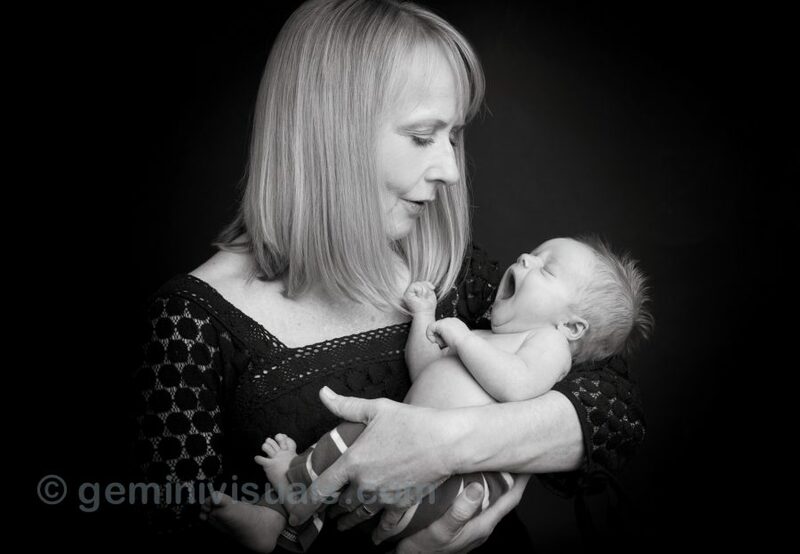 Bristol has been a pilates teacher of mine for many years, and I was delighted when she brought her newborn baby boy to the Gemini Visuals studio for her first photo session. Sometimes our maternity session clients come back with their newborns to help capture both of these momentous occasions in their lives. If you book your maternity and newborn session together, you will receive $25 off of your session for pre-booking. *Book by July 1st and mention this blog post to take advantage of this offer. 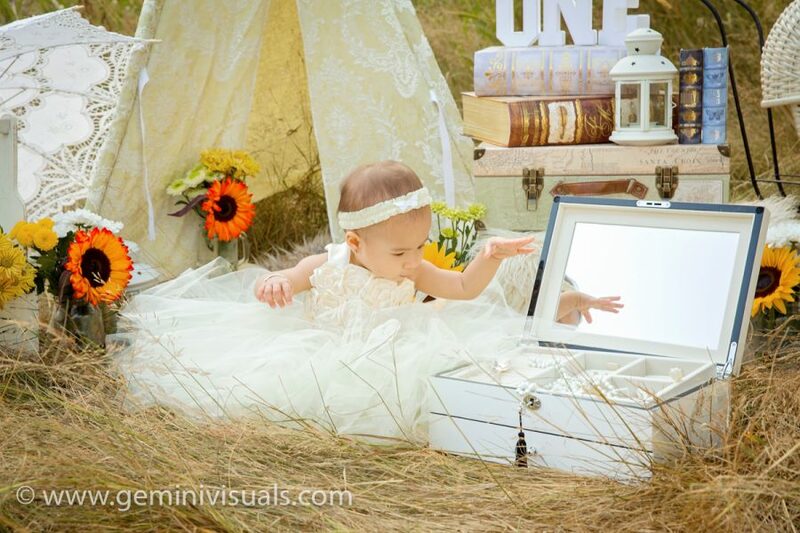 We also have our Baby’s First Year packages that can include a maternity session and newborn photos. Professionally shot photos to capture your baby’s first year make excellent gifts for grandparents, and wonderful keepsakes for busy parents who are sometimes too busy to take more than fuzzy iPhone photos. 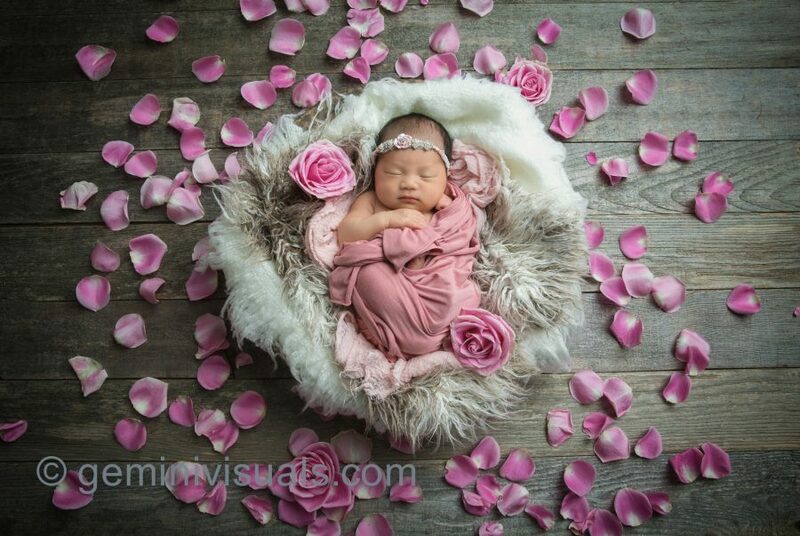 You will never regret getting professional photos taken of your new baby! 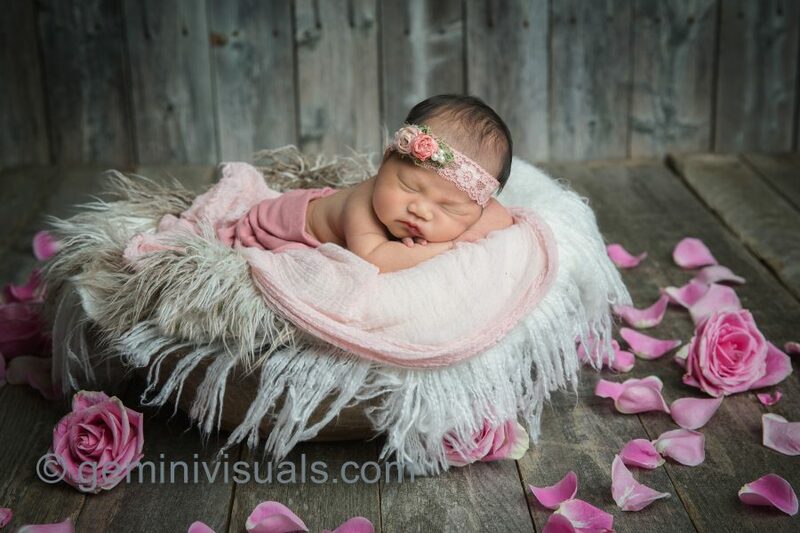 New parents are also encouraged to look through our portfolio on our website to see the variety of props and setups that we can do for a newborn session. 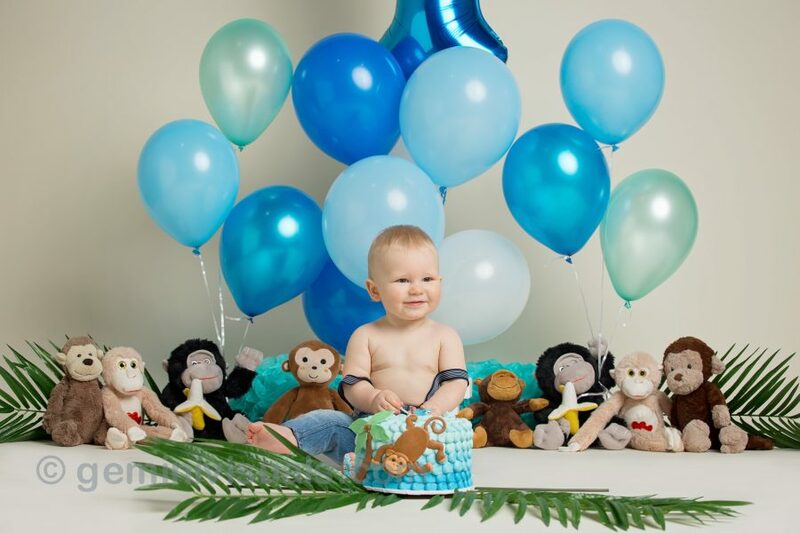 Sometimes we photograph the baby with special props that parents bring or we can do a specific capture that has significant meaning for your family. Before your session, think about something of special meaning to your family or your culture. 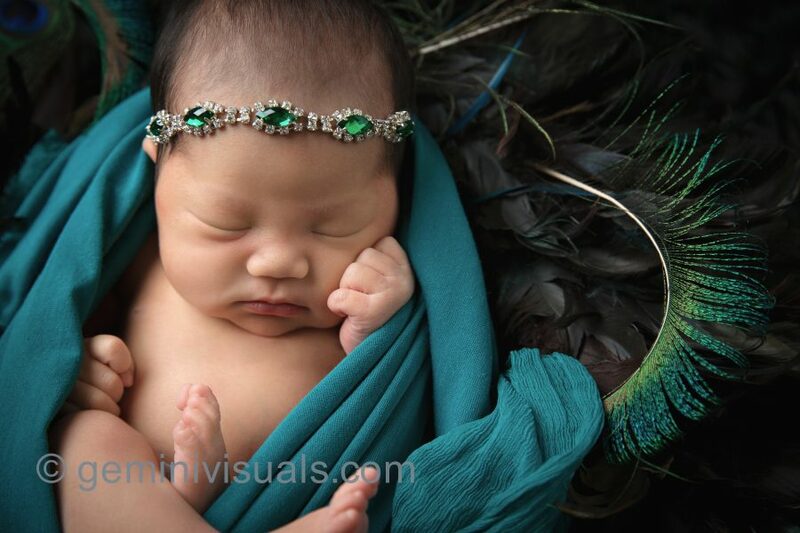 This can make a your newborn session custom to you and create special memories of this time in your life. It goes by very quickly! To book your Maternity, Newborn or Baby’s First Year package, contact us. We can include siblings, grandparents or extended family in your session. Contact us to brainstorm your ideas and we can make your photo session customized to suit your needs. For the past several years, in the Spring, we have done a series of Creative Dance Photo Sessions for the Essence of Dance Senior Dancers. 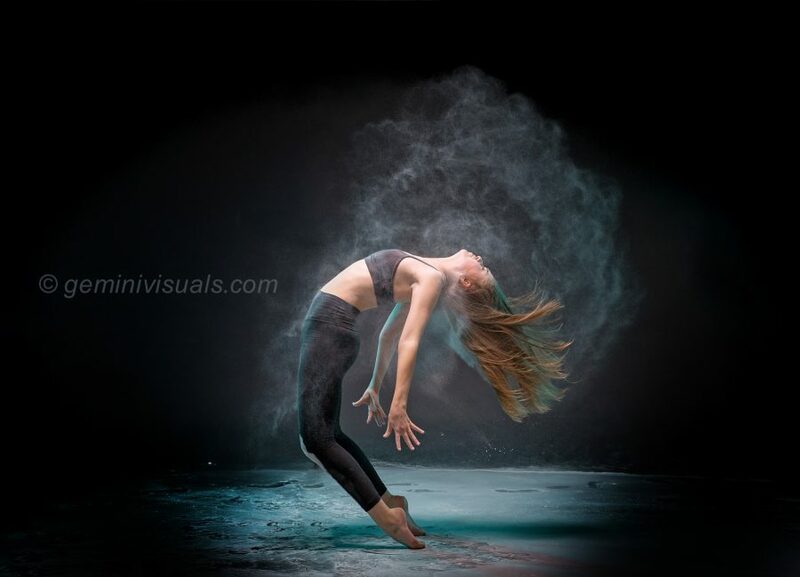 Each dancer participating has the option of doing a photo shoot with either flour of fabric to create a set of photos that celebrate their dance skills. Every year we have a great time capturing each dancer and their unique dance skills. Some dancers excel at leaps and jumps and others are trained in more difficult acro poses. Every dancer brings their own set of skills, experiences and technique to their dance photography session. 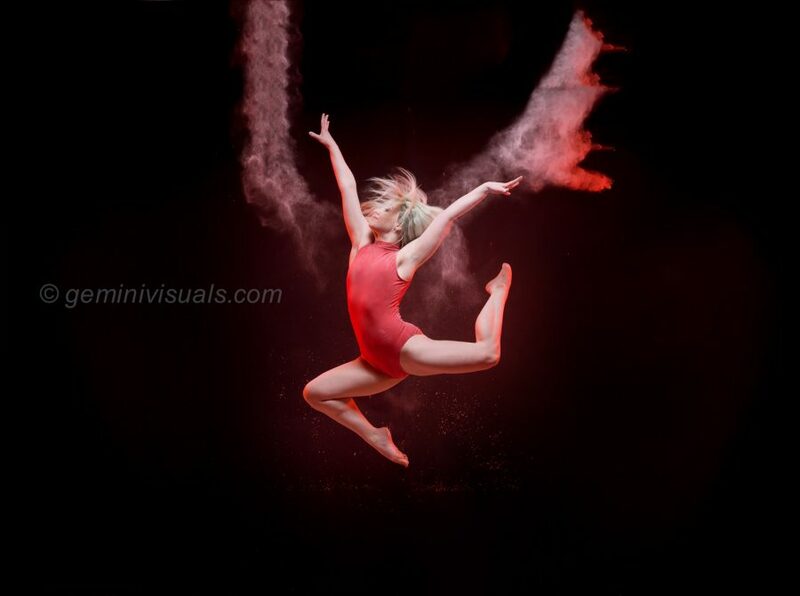 Both recreational and competitive dancers are both able to take part in creative dance photos. We ask that the dancers arrive at least 15-30 minutes ahead of their session to properly stretch and warm up. Each dancer should do some thought ahead of time about which poses they would like to do based on their skill level. Sometimes even the most simple poses can make beautiful photos! Dancers can look at the Gemini Visuals Instagram account and bookmark poses from some of our previous sessions before they arrive. Sometimes we are able to create an abundance of photos and poses that we haven’t done before, simply because of what the dance brings to our studio. Arriving prepared with an idea of what you would like to achieve, can help Adrienne and the dancer create some beautiful images. 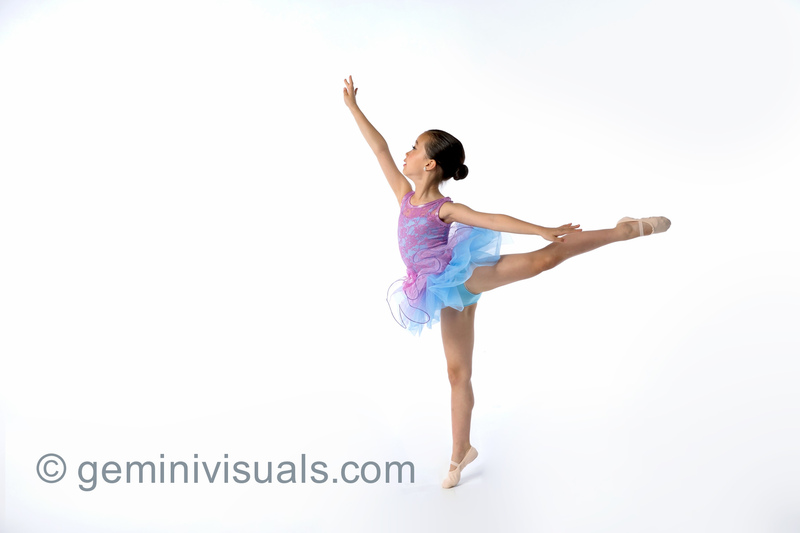 See our portfolio to see exactly what can be achieved in our Surrey Studio for a dance photography session. Contact us to learn more and book your own creative dance session. With flour or fabric, outdoors or indoors, we are open to creating beautiful for your senior dancers or competitive dance team. Congratulations to the Essence of Dance senior dancers on another great year. 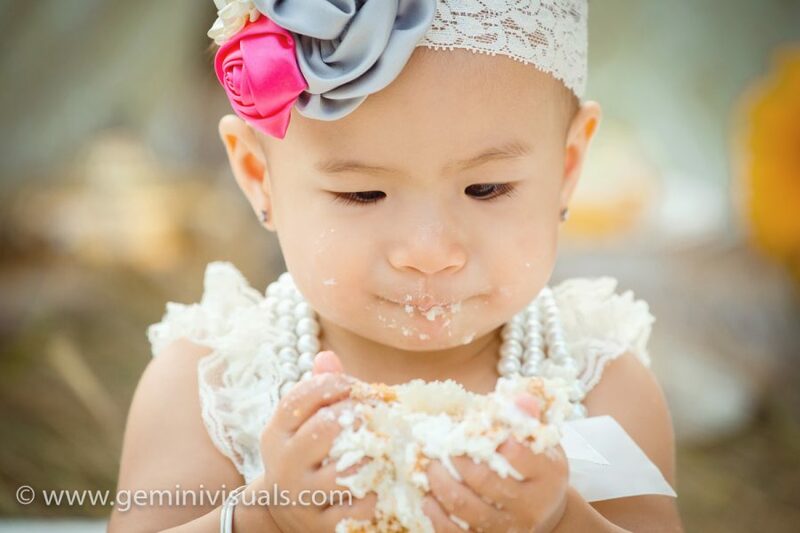 This little darling was a delight to photograph for her first birthday cake smash session. 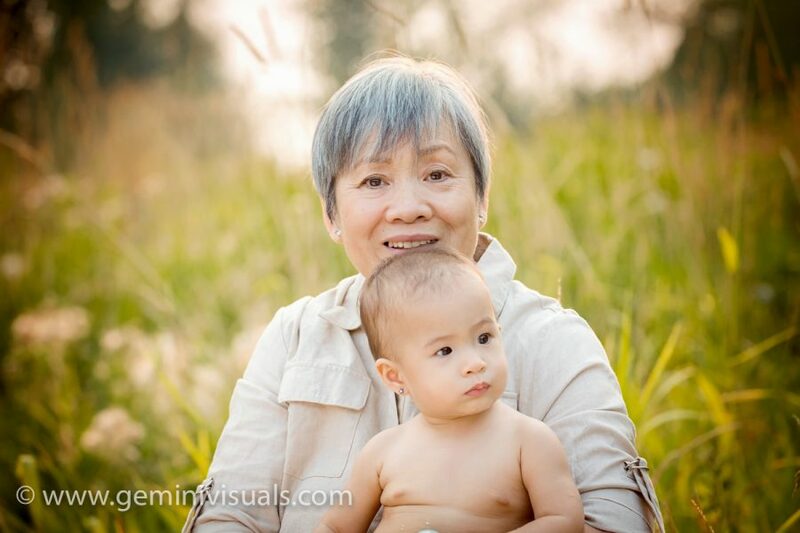 Her Grandma attended the session also, so we were able to create a variety of set ups and photos of her family along with her own birthday photos to celebrate this baby’s milestone birthday. 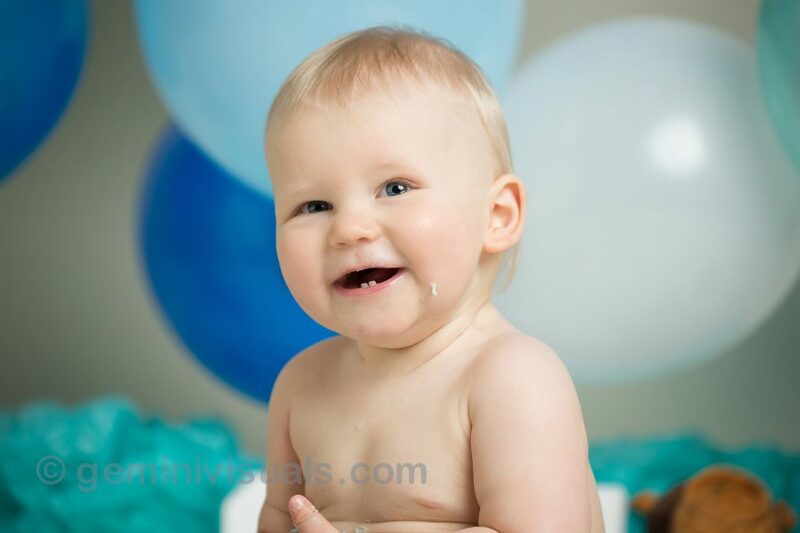 We often book 2 hours for cake smash sessions which includes pre-smash portraits, and then the actual cake smash photos with our Party Package. Not every child has tried cake by the age of one and some are simply not interested and take some coaxing to even try it! This little one was all smiles. 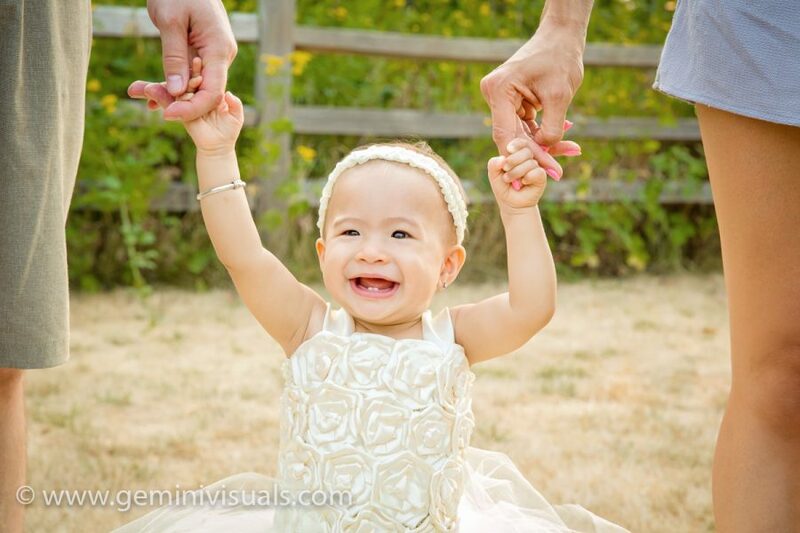 She was very happy and loved every moment of her milestone photo session. It’s fun to do an outdoor set-up with different props and natural lighting. 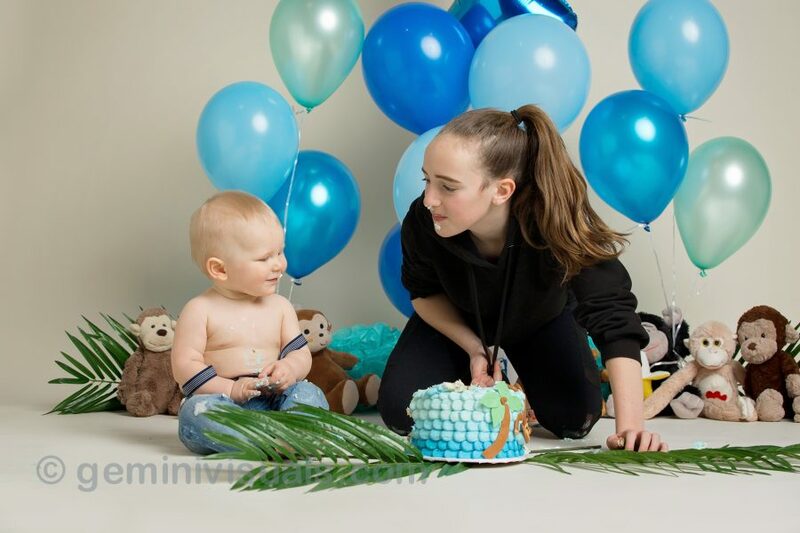 When you book your child’s First Year Package, we will work with you to create the exact session look that you desire with any type of set up. Our new studio houses a variety of props and you can look back at our portfolio to see all of the different styles of cake smash sessions that have been done before. Our cakes which we get from Leah’s Cake Creations, are not only beautiful to look at, they taste good too. If your child doesn’t destroy the cake during their session, you are welcome to take the rest with you. It was a pleasure to capture this little girl’s one-year photos along with some family photos at the same time. It is always a delight to see extended families including grandma’s and grandpa’s and their sweet relationships captured in photos. You can book a Cake Smash Session, Baby’s First Year Package or Family Session though our website. We are open to creating whatever type of photos you desire to capture your family and make memories together. Isn’t this little guy adorable? 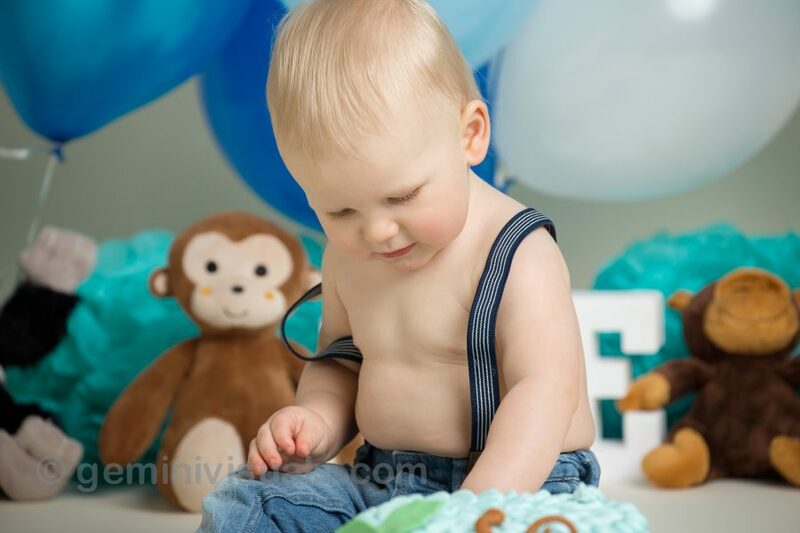 His family came to the studio to celebrate his milestone first birthday with a cake smash session. He loves monkeys so his set consisted of a monkey theme. This cake is from Leah’s Cake Creations, and always, she did a great job of creating this colourful and playful monkey-themed cake. When preparing your child for their cake smash session, remember that it may get messy. Some kids aren’t too interested in the cake, and others love to dig in and eat and get messy, so choose an outfit that you don’t mind getting dirty. You may want to put a little bit of cake on your finger and let them taste it – they may not know that it is edible. Even if they don’t dive right it, we are always able to capture cute photos of them exploring the cake, even if they just take small little bites. This family involved the older siblings in the photoshoot, and we were able to capture some sweet photos of this little boy and his older sisters. They certainly love their brother and it was fun to photograph the family together. His big sisters also helped to show him that he could eat the cake too! Cake smash sessions have grown in popularity, and it’s fun to get the family involved too. Be prepared to clean up afterwards, bring your child a change of clothes, and baby wipes plus a plastic bag to put their dirty clothes in. Many times the cake isn’t too destroyed and we will send the remainder home with you if you like. Despite the cakes getting a little smashed, they still taste delicious! If you are interested in booking a cake smash to celebrate your child’s birthday, you can find our pricing for shoot packages here on our website. 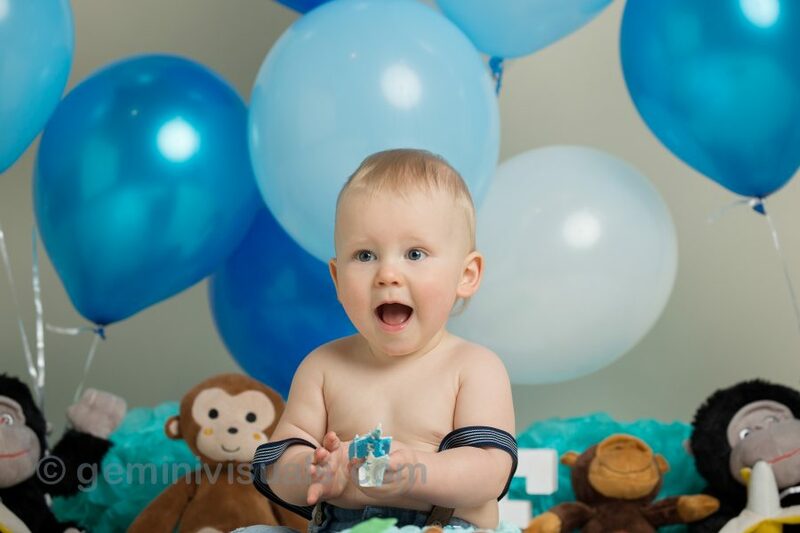 We will work with you to make your baby’s first year celebration extra special! This cute couple has been the subject of our last few blogs. They have been clients for a while and did their creative maternity session first and then their newborn photos with Gemini Visuals. 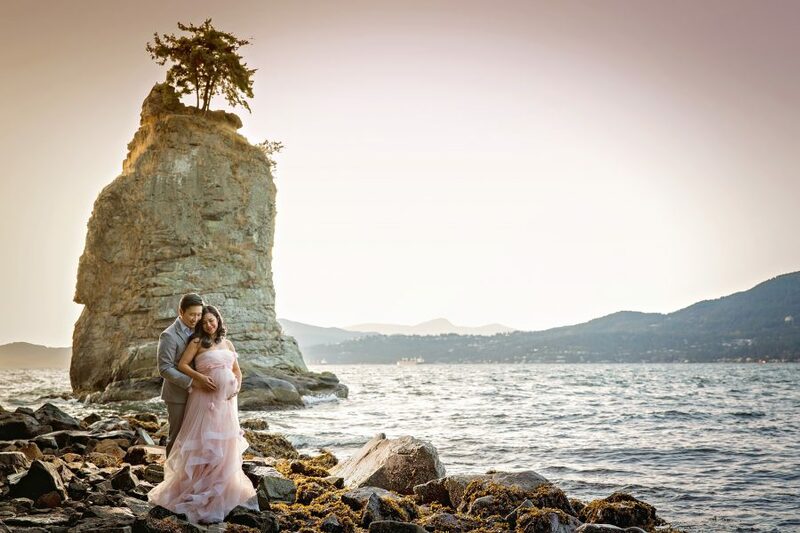 This elegant maternity session was actually a creative session shot in conjunction with Seattle photographer with Eden Bao. It was actually a model call for the session and this couple just happened to already be Gemini Visuals clients! 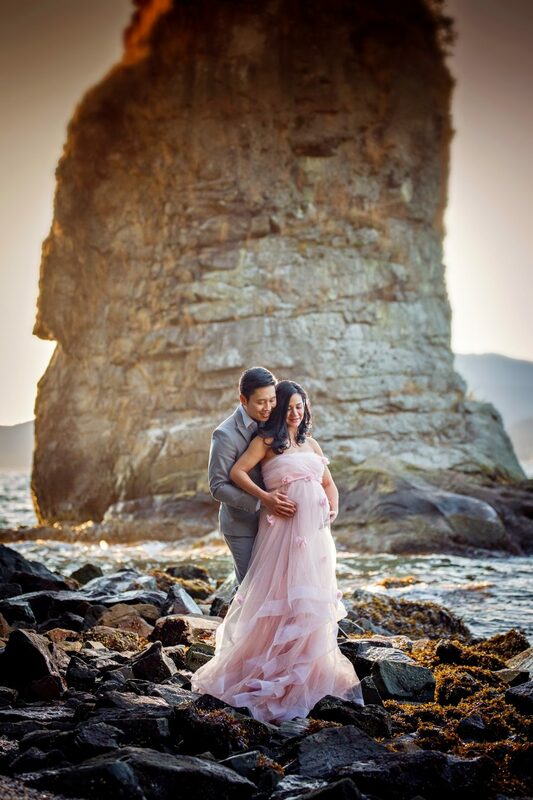 This stunning dress is by Mii Estilo and is part of Eden Bao’s maternity wardrobe that she has for clients. We shot these at Siwash Rock in Stanley Park in Vancouver, and this couple were great sports about being on display along the seawall. The idea behind this shoot was for us to recreate the look of sunset without any direct sun in the photos. It is also interesting to see the results from 2 photographers shooting together, and how their preferences vary and the final photos will be different too. Eden Bao shoots with a Nikon, and Adrienne shoots with a Canon camera and in having two different camera bodies and lens, there were some noticeable differences in the final product. It was also interesting to see how the settings vary quite drastically. Practicing with another photographer is an excellent way to help hone your skills and learn more about your craft, as you can always learn from another photographer’s technique and knowledge. Eden is relatively close in the Seattle area, and we often work together on creative projects. Watch for an upcoming blog on a 3 day workshop we hosted at our South Surrey Studio with Eden Bao. To learn more about her upcoming workshops, visit her website here. Thanks so much to our gorgeous couple for modelling for this session. You can see more of their adorable new baby here. 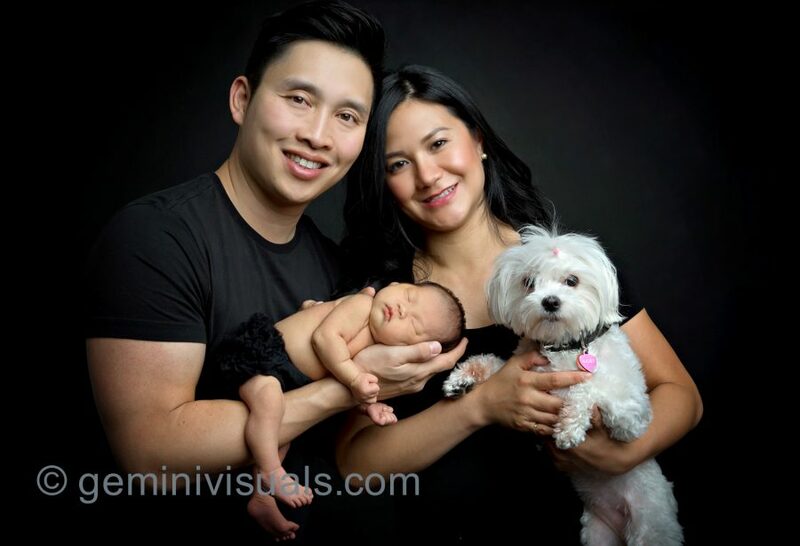 It’s always a pleasure to see families come back to the studio after doing a maternity session at Gemini Visuals – and then we get to meet their newborn baby. This beautiful little girl was a delight to photograph, and we were able to do a variety of photo set-ups with her and with mom & dad and their beloved pet too. 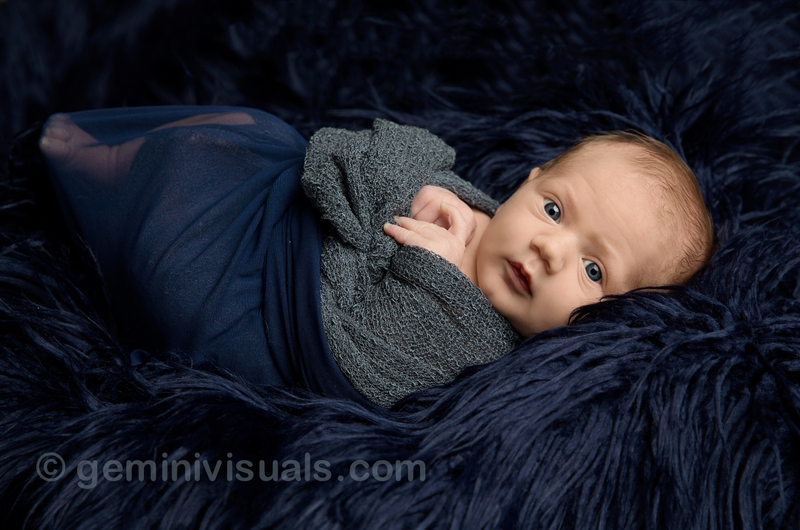 Newborn sessions can take anywhere from 2-4 hours to shoot, since babies can be unpredictable! We have a warm and comfortable seating area in our studio, which is perfect for nursing your baby to sleep and taking the time to calm them if necessary. Adrienne has over 20 years experience photographing newborns and is always conscious of a baby’s sleep schedule and feeding time. She will never push anything that may feel unsafe for your baby and will always keep your baby’s best interests in mind. First, we ask that you take baby down to diaper, and then give your baby a good feed. Ideally if you can time your feedings so your newborn is ready to feed or ready for a top-up when you arrive, then your baby will be nice and sleepy. 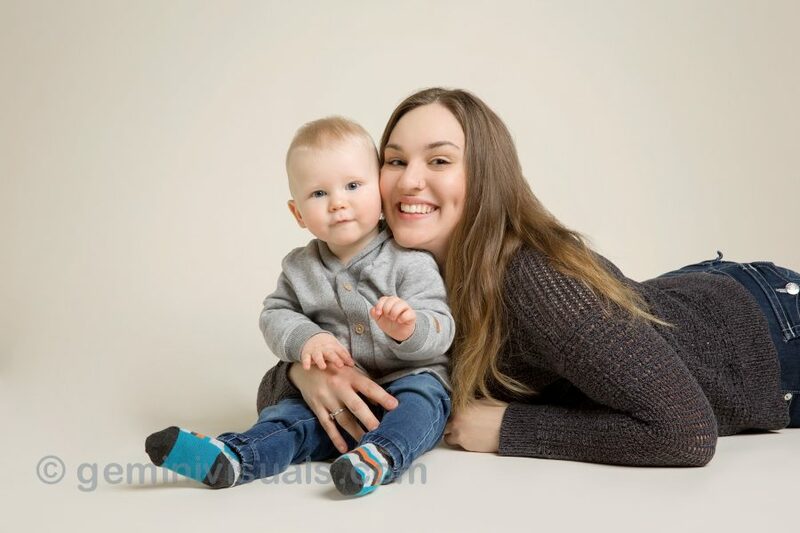 Adrienne will handle, soothe, and move your baby in order to get them into the perfect position for photographs. 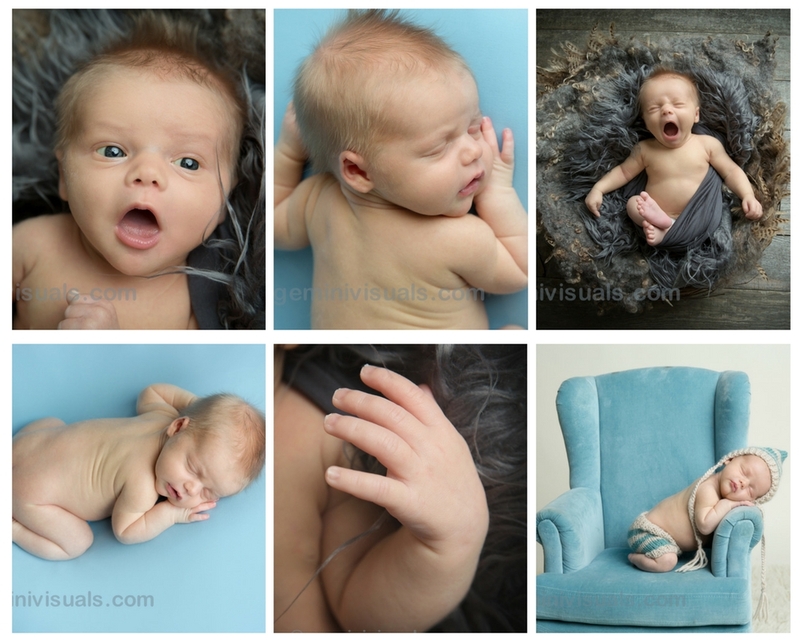 Don’t worry about your baby pooping, or peeing – it happens often and is all part of photographing newborns! 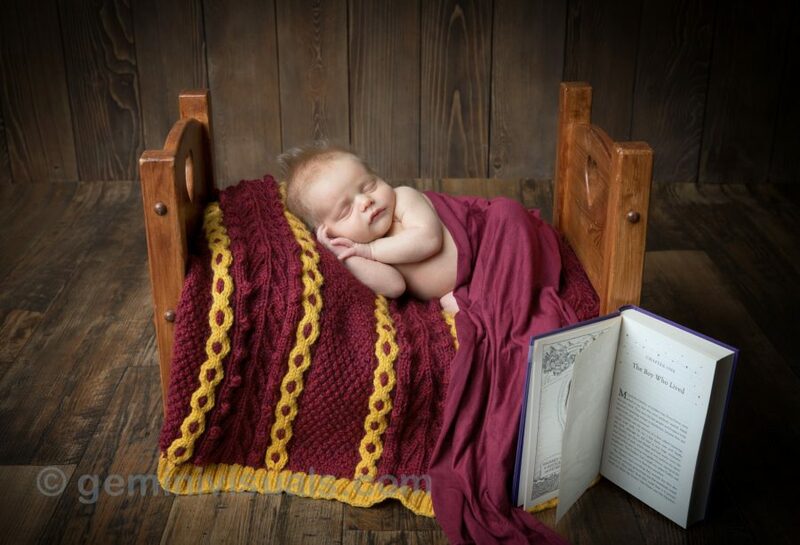 Our new studio location is kept very warm during your session to keep your baby calm and sleepy. It is also recommended that parents bring a change of clothes in case of accidents and also to be comfortable if you are doing your family photos first. For more information on packages available for newborn shoots, take a look at our sessions & packages here. We can’t wait to see this family again for their Baby’s Cake Smash Session. 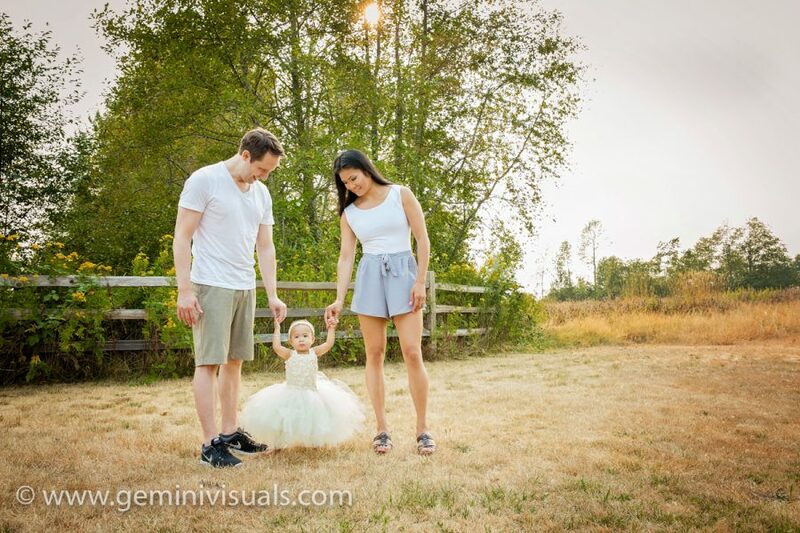 This Surrey maternity session was the first photographed as part of a Baby’s First Year package for these clients. 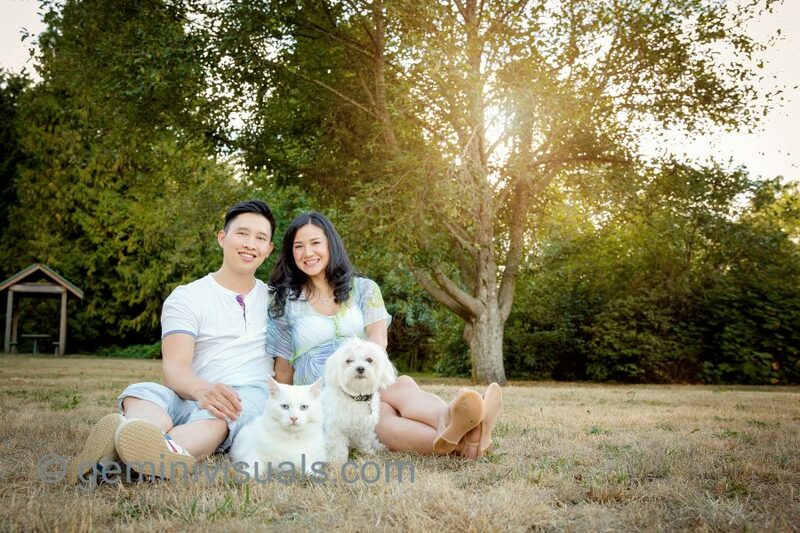 We were delighted when they asked if they could bring in their beloved pets for the session. 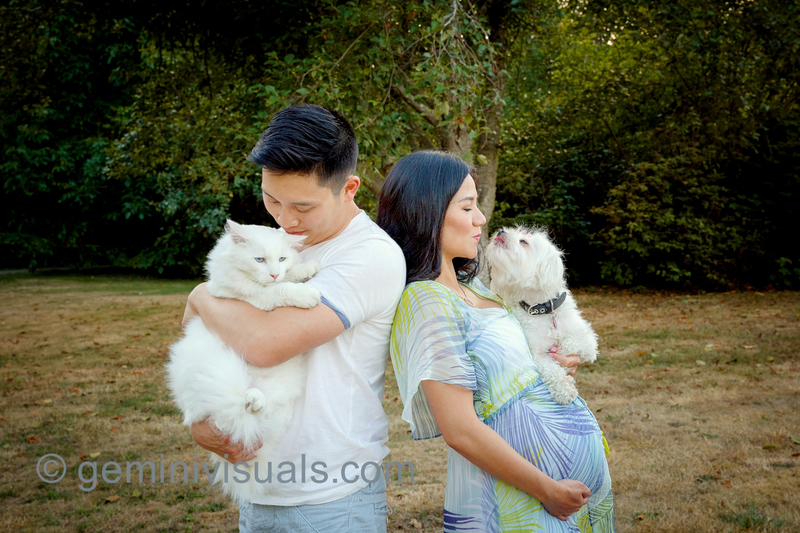 Being a animal lover, Adrienne was more than happy to do some creative maternity shots in this Surrey maternity session. Photographing animals can sometimes be a little bit tricky, but she was able to capture this sweet detail shot with the dog and cat both looking at the camera. Cats are not easy to photograph, especially for an outdoor session. In this case, the kitty was especially well-trained and very chill. Remember that your pets must be leashed in most public areas. 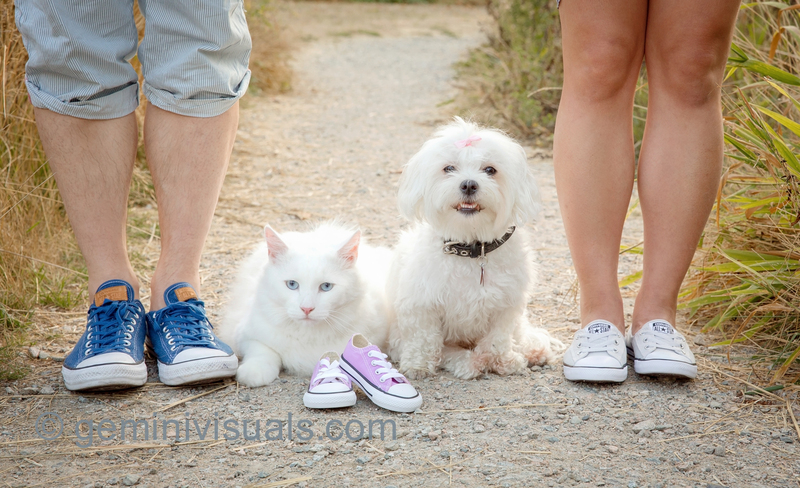 You can contact us if you have a special request for including pets in your photo session. We were able to do a variety of poses and outfit changes during their session. A great tip for any clients is to consider your outfits, and coordinating them with your partner ahead of time. If there is an area to change clothes on-location, it is nice to be able to use a few different coloured outfits and mix up the looks. It gives you more options for your photo packages and you may be surprised at what you end up liking colour-wise. These clients brought their own clothes and she also wore some of our maternity dresses from Sew-Trendy Accessories. This couple was all-smiles and excited for their new baby girl to arrive. We captured these photos on the bridge and paths at Elgin Heritage Park. 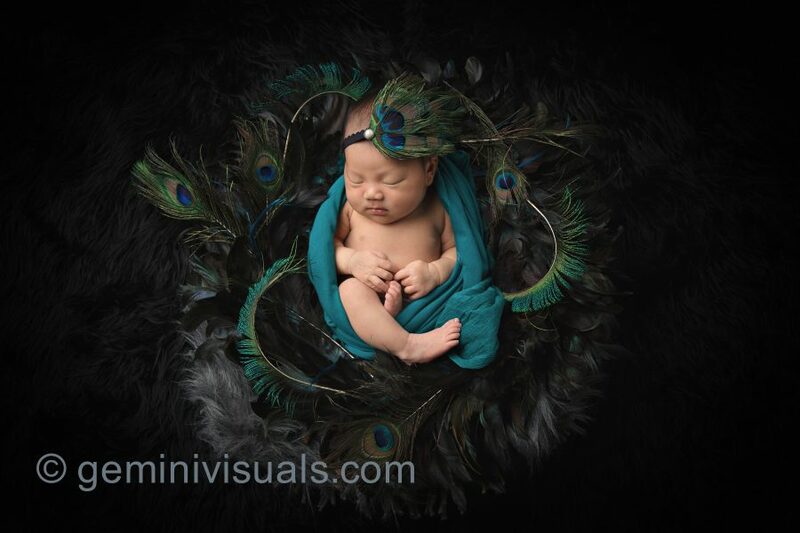 To se up your Maternity session or Baby’s First Year package, contact us on our website or email info@geminivisuals.com. When clients return to our studio with the first addition to their family, it can be a really joyous time for both the family and myself too. I love seeing my client’s extended families grow and in this particular session, I had already done the client’s siblings years before. 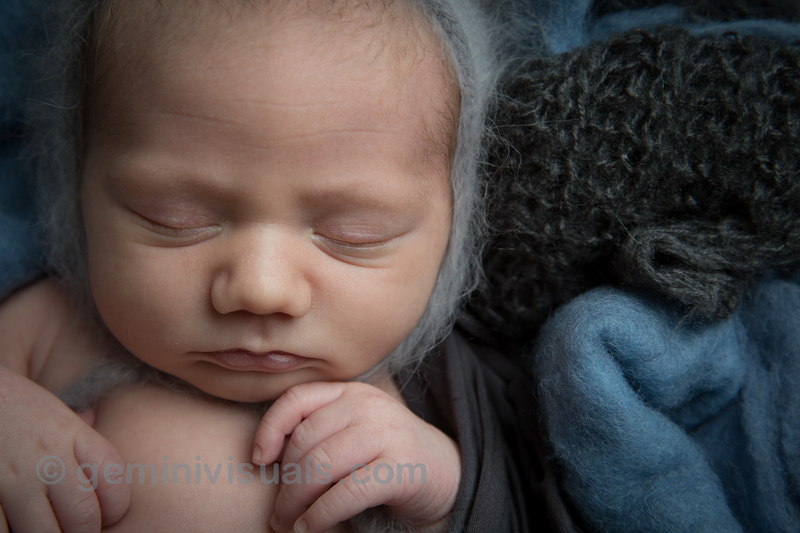 We were able to get some really gorgeous shots of the new baby, including some very sweet ones with his eyes open and alert, and then also cuddled up in a sweet slumber. When our clients consult with us prior to their session, we can brainstorm together some ideas for the types of images that they want from their shoot. 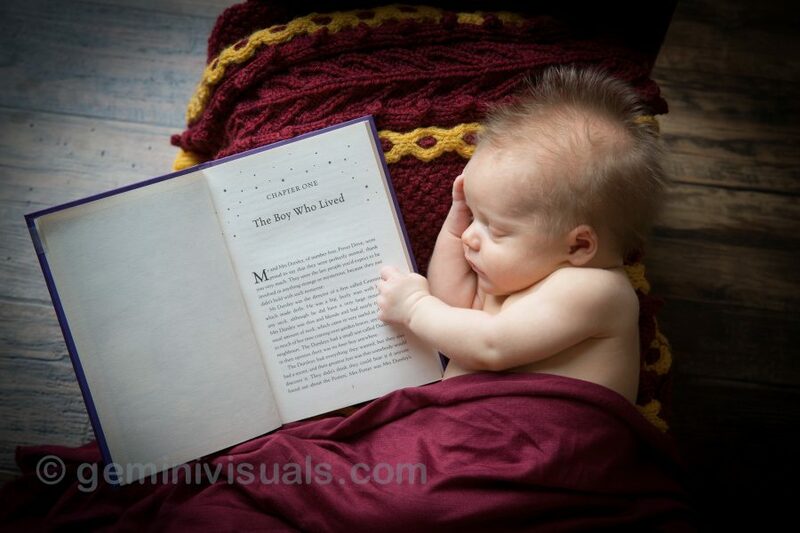 In this case, the family really wanted to do some Harry Potter-themed photos with their newborn – so we were able to capture some very sweet images in this particular theme. Detail shots are also sometimes over-looked by parents of newborns, as we all want to see their sweet faces! However, photos of details of their tiny little feet and hands can make for extra special memories to cherish, as we know that they grow very quickly. I love the images of their little fingers and toes. 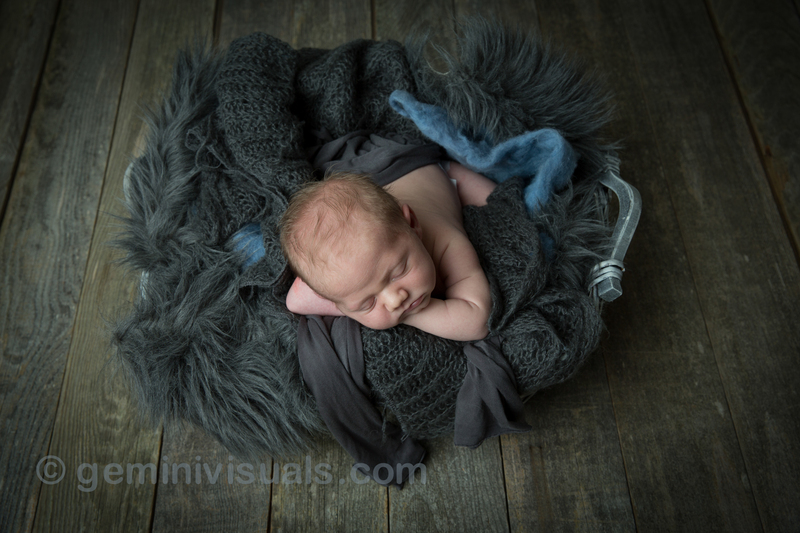 We also captured some with a little grey hat and this blue knit outfit by Goodnight Baby by Nook. Another thing that this family wanted to capture was some images including the grandparents in the session. Grandpa’s arms are seen holding the baby and Grandma was just as eager to hold her new grandson. To book your Newborn Session or Baby’s First Year Package, contact us on our website or call 604-312-6330 for more information.